With the death of John, this branch of the Sinton family tree comes to an end. 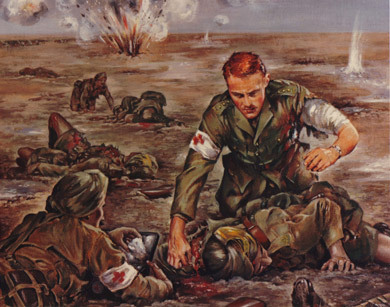 "On 21 January 1916 at Orah Ruins, Mesopotamia, Captain Sinton attended to the wounded under very heavy fire and although he was shot through both arms and through the side he refused to go to hospital, remaining on duty as long as daylight lasted. In three previous actions he had also displayed the utmost bravery." He later achieved the rank of Brigadier General. His VC is located at the Army Medical Services Museum, Aldershot, England. John Alexander Sinton is the only man ever to have been both a holder of the Victoria Cross and a Fellow of the Royal Society. 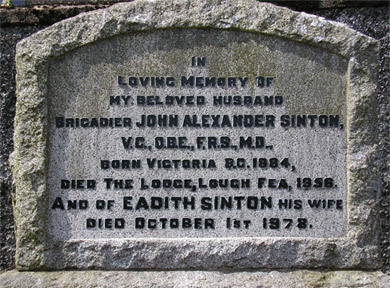 Sinton was born in Canada but returned with his family to their native Ulster in 1890. Educated at Nicholson Memorial School, Lisburn and then at Belfast Royal Academical Institution he went on to study medicine at Queen's University, Belfast. In 1911 Sinton entered the Indian Medical Service, serving with the military branch from 1912. 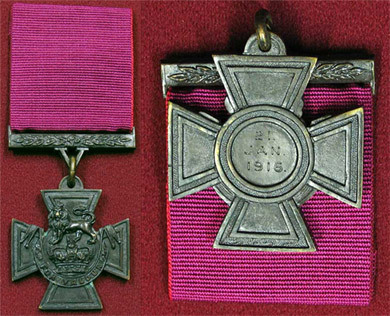 It was in 1916, during service as a medical officer to an Indian cavalry regiment serving in the Mesopotamian Campaign, that he saw the military action that led his receiving the Victoria Cross. Sinton's citation reads that he showed "most conspicuous bravery and devotion to duty. Although shot through both arms and through the side, he refused to go to hospital, and remained as long as daylight lasted, attending to his duties under very heavy fire. In three previous actions Captain Sinton displayed the utmost bravery." Sinton transferred to the civilian branch of the Indian Medical Service in 1921, researching malarial parasites, treatment and immunity. In 1925 he was appointed the first director of the malaria survey of India at Kasauli, which was to become one of the chief centres of malaria research. Sinton retired from the Indian Medical Service in 1936 continuing his research at the London School of Hygiene and Tropical Medicine and at the malaria laboratory of the Ministry of Health. During the Second World War he was recalled to the Indian Medical Service as a reservist, commanding a hospital in India. He was then appointed successively as consultant malariologist to the East African Force, the Middle East Command and finally to the War Office. After the war he retired to Cookstown, Northern Ireland where he continued to be actively involved in Queen's University and in his local community. Sinton's contributions to malarial research led to many honours and awards. He was elected a Fellow of the Royal Society in 1946. His scientific achievements were summarised in his citation: "It is doubtful if any other author during the last thirty years ... has contributed more largely and importantly to scientific knowledge of malaria or has worked more originally and assiduously to advance such knowledge." Altogether a remarkably courageous and tenacious individual. Sinton's medals are on display at the Army Medical Services Museum. 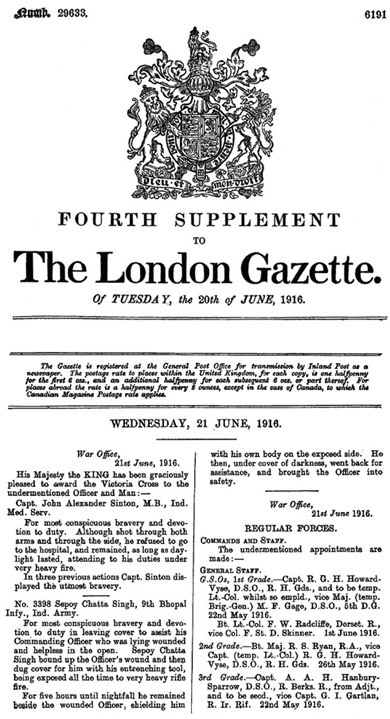 The 'London Gazette' and 'Royal Society' items supplied by Robert Vint, grand-nephew of John Alexander Sinton. Next March marks the 50th anniversary of the death of an Ulster hero whose genius and dedication were responsible for saving thousands of lives. John Alexander Sinton, winner of a Victoria Cross almost 90 years ago, didn't just fight his nation's two-legged enemies. As an expert in tropical diseases, particularly malaria, he pioneered treatment and prevention, saving countless lives among the Allied troops in the Second World War in particular. Although born in Victoria, Canada, in 1884, his parents were of Ulster stock - his father from Co. Down and mother Co. Armagh - and he was sent back home as a boy to be educated, attending the Nicholson Memorial School (now Christ Church Parochial Hall in Lisburn), the Royal Belfast Academical Institution and finally Queen's College in Belfast. He graduated with first class honours in medicine and later added a Bachelor of Medicine, Bachelor in Surgery and Bachelor in Obstetrics to his CV. He worked at the pathology department at Queen's, held an appointment at the School of Tropical Medicine in Liverpool and posts at the Royal Victoria and Mater hospitals in Belfast. His military connection began after he joined the Indian Medical Service in 1911, being appointed medical officer to the 31st Bengal Lancers, and was on active service at the North west Frontier when the First World War broke out in 1914. As part of the Mesopotamian Expedition Force he soon found his skills in treating tropical diseases in great demand as it was illness, rather than the Turks or rebel Arabs, which was claiming the most lives among his men. But on January 21, 1916, he found himself - not for the first time as three previous occasions when he showed tremendous courage are mentioned on his medal citation - at the sharp end at Orah Ruins, Sheikh Sa'ed, Mesopotamia. Captain Sinton, then 31, was attending the wounded under heavy fire when he was himself hit a number of times. Despite being shot in both arms and through the side he refused to go to hospital but remained in the firing line to treat others until nightfall. He was mentioned in despatches a further four times before the war's end and again twice more for actions in Afghanistan and Waziristan on his return to India. Among the other honours bestowed on him was an honorary degree of doctor of medicine from Queen's University "in recognition of his early distinctions and of his valour in the field while engaged in the treatment and succour of the wounded" and, in 1921, the OBE. After returning to civilian life he worked in medical research in India, particularly the treatment of malaria, up to 1938 when he retired. The start of the Second World War, however, saw his recall. He served as Quartermaster to a military hospital in India, then consultant malariologist, initially to the East African forces and later those serving in the Middle East. 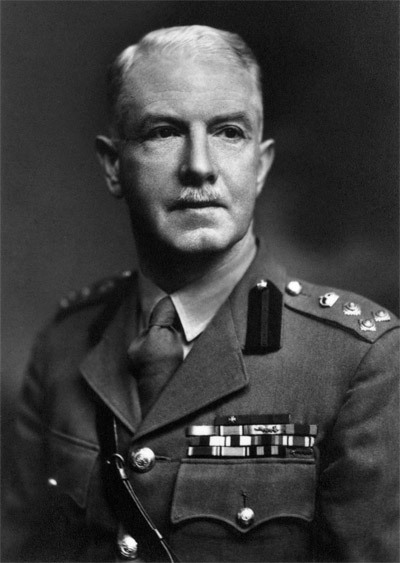 In 1944 he was appointed to a similar role with the War Office because of an outbreak of malaria among the troops in Sicily and Italy. Retiring at last from military service, with the rank of brigadier, he settled in Cookstown, Co. Tyrone, where he occupied at various times the roles of Justice of the Peace, Deputy Lieutenant of the county, High Sheriff for Tyrone, Queen's University Pro-Chancellor and president of the Cookstown RBL. Following his death on March 25, 1956, at the age of 72, he was buried with full military honours at Claggan Cemetery. Such was the esteem with which Brigadier Sinton was held, a tradition started in which the old soldiers of Cookstown Royal British Legion gathered at his graveside on the eve of Remembrance Sunday to pay homage. A small housing block for ex-service couples, built by the Royal British Legion Housing Association, was named in his honour, as was one of the Halls of Residence at Queen's. Fittingly, his Victoria Cross is displayed at the Army Medical Services Museum at Aldershot. Author, Steven Moore, is a News Letter journalist. Transcribed from an article which appeared in the 'Ulster Scots' newspaper 28 May 2005. The images from the Army Medical Services Museum, Aldershot were kindly supplied by the Curator, Capt. (Retd.) P. H. Starling, DHMSA, FRHistS.